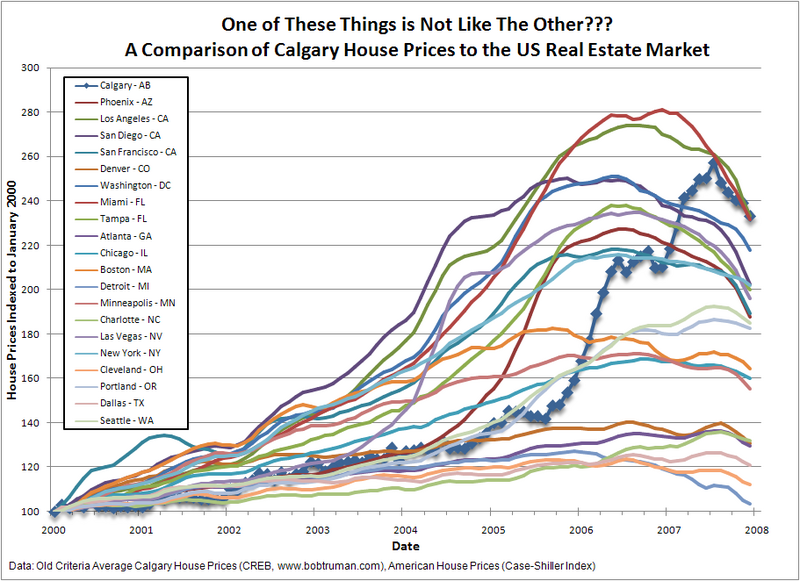 Posted by DustinRJay in Calgary real estate, mortgages, supply and demand, Uncategorized, US real estate. As discussed in a previous post, leading indicators at that time had pointed to the balance of inventory tipping towards excess demand in the near term. 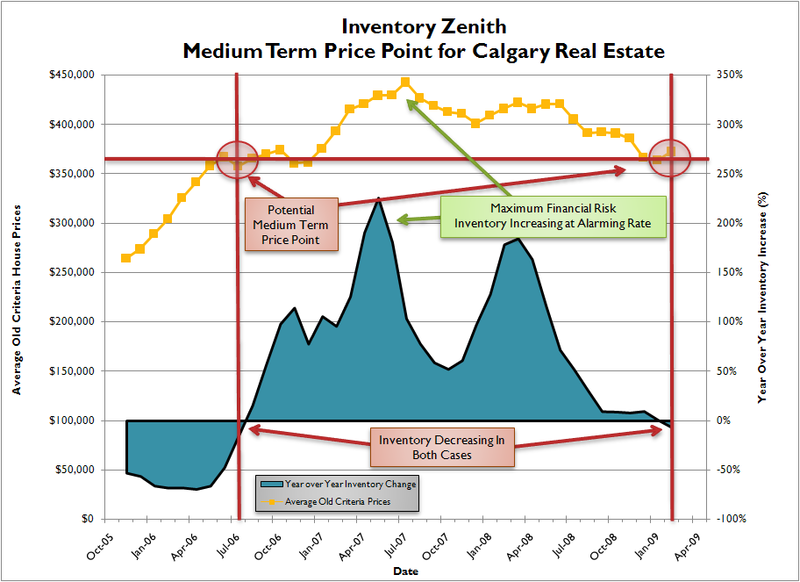 That has now happened, and year over year inventory is down 7% in Calgary. The following graph illustrates a potential medium term price point. It is based on two points wherein inventory was dropping on a year over year basis. Prices dramatically above these points may lead to excess supply, and prices below have tended to lead to excess demand. Wave of speculators in 2006 & 2007 resale market now appears to be over and unlikely to be a source of supply for some time. Calgary single family home construction was the lowest since 1995 in 2008 and the low level of housing starts is expected to continue into 2009. This is lower than demographic growth and therefore resale inventory appears poised to continue siphoning off from it’s current high levels. Drop in interest rates is likely having an impact on inventory. As interest rates drop, the yield spread between rent and mortgage rates improves thus increasing affordability and relative investment value. Some investors and homeowners may choose to delist if they believe their is more value in renting, or that the resale market is likely selling at a bigger discount to the new home construction market. New construction inventory may not be able to be supplied at the current price point. Note: Buyers need to run various budget scenarios to determine the risk of rising interest rates. Mortgage arrears in Alberta, while expected to rise, are at cyclical averages. Mike Fotiou, at First Place Realty, lists approximately 2.3% of inventory on the market as a foreclosure or judicial sale. This contrasts to the situation in the United States where 45% of sales are distressed properties. Canadian banks had argued that only 5.4% of Canadian mortgage market originations were nonconforming, compared to 33% of the market in the US was subprime and Alt-A. To date, the reduced exposure to shady loan origination practices in Canada appears to have largely insulated our housing market from the same level of credit defaults. As in the US, the extent of credit defaults will not be fully understood until house prices find a bottom. As year over year inventory is already dropping, this does not seem to be a large source of supply. Absorption rate is a source of imperfect information that may results in real estate mispricing. For instance, the absorption rate was 3.1 at the peak of the market in July 2007 and could have been perceived as a ‘good time to buy’ or ‘balanced market.’ However, year over year inventory increases were greater than 100% at the time and should have been an extremely strong indication that the market was about to correct. I think that absorption rate provides a good estimation of how the market will behave in the near term. However, a comparison of year over year inventory changes may provide a better estimate of how the market will behave in the medium term. Posted by DustinRJay in Calgary real estate, US real estate.